Artificial Intelligence is, currently, one of the most investigated field in all the disciplines, due to its impact of human-being advancement. AI field includes a broad set of possible research directions so that, if the final goal is a macro-view of the Big Picture, we need to adopt a multi-disciplinary point of view, that is my approach to research. The concerns about applications in industrial, job, social, economic, legal, health systems need a deep reasoning about protection and regulations, since we are called to figure out how we wish to integrate new artificial intelligent machines in our life. 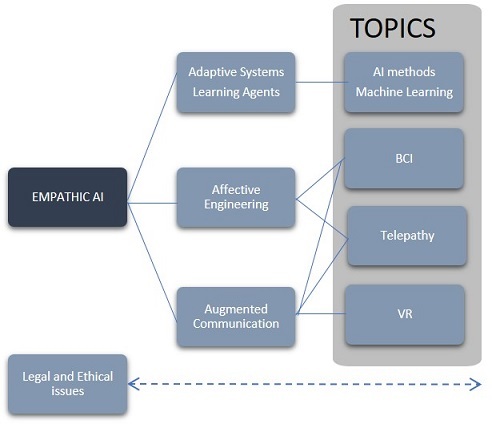 Within the Big Picture, empathy appears as the greatest protection and, at the same time, the great challenge forArtificial Intelligence advancement, that is the reason why my research activities keep into consideration this final goal in every basic-research investigation. last, but not least, the augmented communication dimension, focusing on human-machine interaction, at the basis of any future development in the technological field and human being progress. Legal and Ethical issues are, of course, the frame of this big picture.